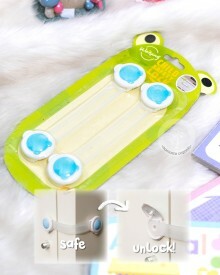 Multifunction safety Lock can be used in the cabinet, drawer, refrigerator, doors, windows, etc. The product prevents hurting fingers when children play the doors or Cupboards. Please wipe clean the paste the dust and moisture oil. Tear off the isolation paper on adhesive tape, and press it firmly. Don't try to pull when you just pasted it, it will affect the tape sticky.